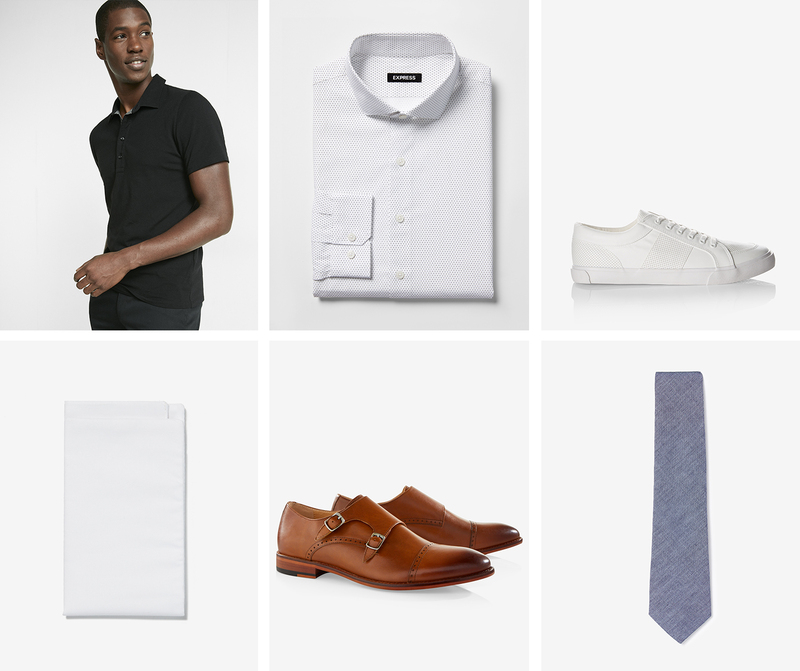 Nothing instills confidence quite like a perfectly tailored suit, complete with a crisp tie, sleek shoes (or sneakers! ), and complementary pocket square to top things off. It’s a tried-and-true formula that served us well for generations as other trends came and fell by the wayside. But let’s face it, suiting up every single working day of the year isn’t the easiest thing to do, especially when travel is involved. Since the beginning, Express has endeavored to make the getting-ready process a little more seamless and a lot more enjoyable by designing a curated range of classic, slim, and extra-slim suiting options. Now, we’ve gone a step further with what very well may be the be-all, end-all suit your wardrobe has been waiting for. Meet our 365 Suit, tailor made for maximum comfort and style any time of the year. These wool-blend pieces are designed to regulate your body temperature, which means they keep you cool when it’s hot and warm when it’s cold. But wait, there’s more! The 365 Suit is constructed of odor-trapping, stretch fabric and features multiple pockets to stash your phone, cash, or passport, making it the perfect fit for business trips. Much like your frequent flier account, the navy 365 Suit is made to rack up mileage. 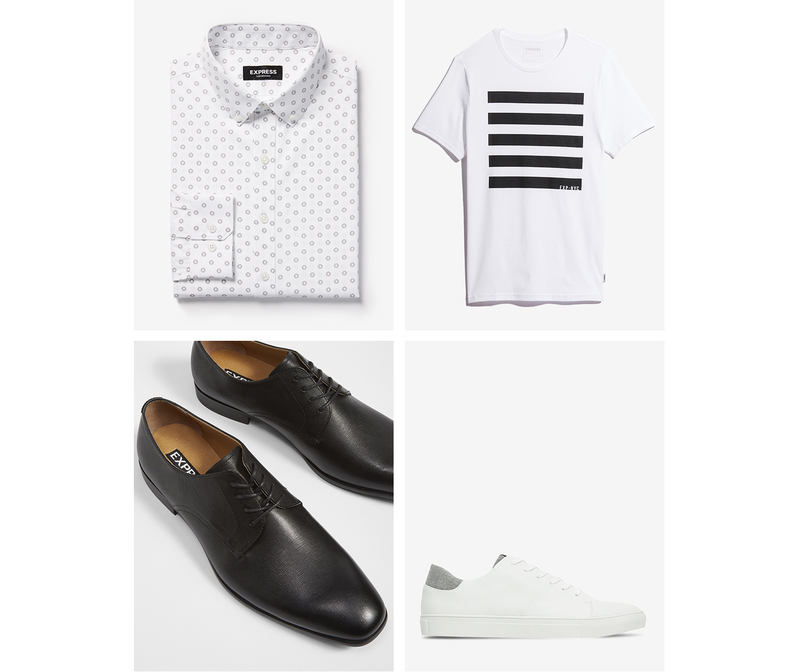 Dress it up with a microdot dress shirt, chambray tie, and burnished monk strap shoes for client meetings, or go casual during the dog days of summer with a moisture-wicking black polo shirt and fresh white sneakers. Swap out your polo for a fleece hoodie when the temperature starts to drop for a more fashion-forward vibe. There’s really no wrong way to wear it. Black suits can sometimes come across as stuffy, but pairing the 365 Suit with a super fresh patterned Performance shirt will give your overall look a little more edge, especially if you rock the air tie. 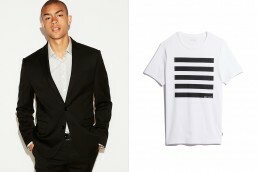 You can also opt for a black and white graphic tee. Aim for simple geometric blocking or minimal designs for maximum effect—this is definitely one of those less-is-more situations. When winter comes around, stick with a darker color palette, or take a full on murdered-out approach with a black dress shirt and Chelsea boots. Those are just a handful of ways to style our new 365 Suits. There are 188 days left in the year. What are you waiting for? Go forth and suit up!